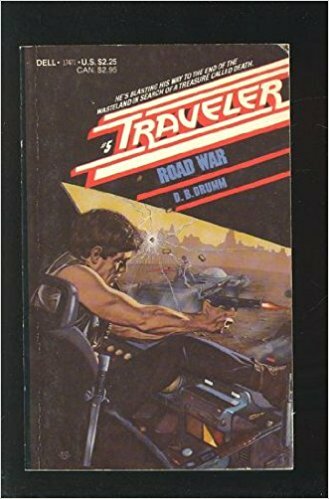 Call shotgun, but only if you’ve got one, because it’s time for IDEOTVPOD to hit the open, post-apocalyptic road with our latest men’s adventure trip, D. B. Drumm’s Traveler #5: Road War. We’re under assault from every angle, with buffets of hot first draft prose, torrents of serious horror violence, and dollops of good politics (amongst sprinkles of bad). So pop the clutch and tell the world to eat your dust, because we’re grabbing John Shirley and blasting across the alkali flats in a jet-powered, monkey-navigated hot rod with a book that has everything short of the protagonist finding somebody’s keys tucked into the sun visor of their vehicle. Come for the seriously fun pulp satire, but STAY for your hosts talking trash about everything under the sun (and mixing in a couple-three impressions that may (or may not) surprise you). ALSO: this episode has the debut of a great new feature that we’re sure to remember to do going forward, a moment where we dedicate the episode to somebody! Further reading: long, good interview with John Shirley; incredible resource about pulp fiction.